How to restart VMs after a power outage? How to support advanced CPU flags in virtual machines? How to fix the keyboard mapping for virt-manager? This tutorial demonstrates how to install manually a StratusLab cloud infrastructure using the StratusLab system administrator command line utilities. A minimal StratusLab cloud consists of two physical machines, although additional machines may be necessary if the internet cannot be accessed. The StratusLab distribution provides a simple command line client to install, configure and start the StratusLab Cloud services and components. Ensure all prerequisites are satisfied. Define all of the StratusLab service parameters. Install and configure the Front End, containing the VM management service (OpenNebula) and the storage management (Persistent Disk) service. Install and configure the Node(s) via SSH from the Front End. By default KVM is used for the hypervisor on the Node(s). Validate the installation by starting a virtual machine. The hardware virtualization extensions must be enabled in the BIOS on the “Node” machine. Many vendors ship machines with these extensions disabled. In general cloud infrastructures prefer “fat” machines, that is machines that have a maximum number of CPUs, RAM, and disk space as possible. This is because the maximum size of a single virtual machine is limited by the size of the largest physical machine. Install a minimal version of CentOS 6 on the two physical machines that will be used for the cloud infrastructure. You must reboot the machine for this to take effect. The default version of Python installed with CentOS should be correct. StratusLab requires a version of Python 2 with a version 2.6 or later. The StratusLab command line tools do not work with Python 3. StratusLab allows for a variety of storage options behind the persistent disk service. The tutorial uses the defaults using LVM and iSCSI. The machines must be configured to use LVM for the disk storage. 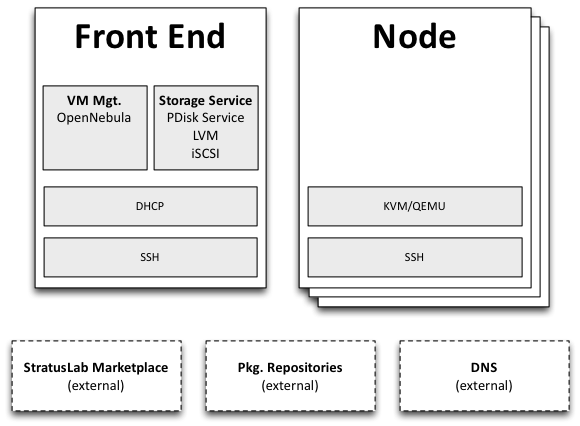 The Front End must be configured with two LVM groups: one for the base operating system (~20 GB) and one for the StratusLab storage service (remaining space). The “Node” machine can be configured with a single LVM group. Below, we assume that the volume group names are “vg.01” for the operating system and “vg.02” for the StratusLab storage service. You can use other names, but then change the commands below as necessary. The configuration for the CentOS repository is done when the system is installed. The others require additional configuration. This will add the necessary files to the /etc/yum.repos.d/ directory. replacing the URL with the version you want to install. This may take some time if you installed the base operating system from old media. Ensure that the hostname is properly setup on the Front End and the Node. The DNS must provide both the forward and reverse naming of the nodes. This is required for critical services to start. Set the hostname if it is not correct. Throughout this tutorial we use the variables $FRONTEND_HOST ($FRONTEND_IP) and $NODE_HOST ($NODE_IP) for the Front End and Node hostnames (IP addresses), respectively. Change these to the proper names for your physical machines when running the commands. The authenticity of host 'onehost-5.lal.in2p3.fr (134.158.75.5)' can't be established. RSA key fingerprint is e9:04:03:02:e5:2e:f9:a1:0e:ae:9f:9f:e4:3f:70:dd. Warning: Permanently added 'onehost-5.lal.in2p3.fr,134.158.75.5' (RSA) to the list of known hosts. And verify that the password-less access works as expected. Now that SSH is properly configured, the StratusLab scripts will be able to install software on both the Front End and the Node. A DHCP server must be configured to assign static IP addresses corresponding to known MAC addresses for the virtual machines. These IP addresses must be publicly visible if the cloud instances are to be accessible from the internet. If an external DHCP server is not available, the StratusLab installation command can be used to properly configure a DHCP server on the Front End for the virtual machines. This uses a DHCP server on the Front End. A network bridge must be configured on the Node to allow virtual machines access to the internet. You can do this manually if you want, but the StratusLab installation scripts are capable of configuring this automatically. This tutorial allows the installation scripts to configure the network bridge. The entire StratusLab Cloud is configured from a single configuration file /etc/stratuslab/stratuslab.cfg. This file contains many options, but only a few are required. StratusLab ships with a default configuration file in the standard location and a reference configuration file located in /etc/stratuslab/stratuslab.cfg.ref. To simplify viewing the configuration parameters and changing them, the stratus-config command can be used. To change a value, specify the key and the new value. To view a single value, simply specify the key. We will use this command to set the various configuration parameters below. Similar parameters must also be set for the Persistent Disk service. For this tutorial, this service is installed on the Front End, so the same IP address should be used. The Persistent Disk service and the Nodes communicate using a strategy defined by the persistent_disk_storage and persistent_disk_share parameters. The default values (“lvm” and “iscsi”, respectively) will be used for this tutorial. # Provide detailed parameters for storage backend plugins. If you’ve used another name for the LVM volume group, then change the above command. In this example, the Front-End is configured on IP address $FRONTEND_IP and three IP/MAC address pairs are defined for virtual machines. You must use the real values for the Front End IP addresses and for the range of addresses you will use for the virtual machines. More network parameters are described in the “one-network” section in the reference configuration file. Use your values for these parameters! To get more details on what the command is (because of curiosity or errors), use the option -v, -vv, or -vvv. If you run into errors, the stratus-install command can simply be rerun after adjusting the configuration parameters. The deployment of the StratusLab Nodes is done from the Front End, thus, all the commands below should be run from the Front End. Check carefully the name of the interface on the node! As before, you can increase the verbosity level by adding the option -v or -vv. At this point, you have both the Front End and one Node installed. This is a functional installation, but you have not yet authorized any users for the cloud. Here we will create a new StratusLab user account. Note that StratusLab accounts are independent of the Unix accounts on the machine itself. Add the following line to the end of the file /etc/stratuslab/authn/login-pswd.properties. The StratusLab distribution supports other authentication methods (LDAP, X509 certificates, X509 proxies, etc. ), but a username/password pair is the simplest for this tutorial. Now we will test that the cloud functions correctly by starting a new virtual machine instance and logging into it. We’ll test the cloud service from a normal Unix user account on the Front End. It is very likely that the user client commands are already installed. Now log in as the user and setup the account for using StratusLab. An SSH key pair is required to log into your virtual machines and the client requires that a complete client configuration file. Log in as the user and create an SSH key pair. This is similar to the process used for the root account on the machine. Now copy the reference configuration file into place and edit the parameters. You will need to set the “endpoint”, “username”, and “password” parameters in this file. For the “endpoint” use the hostname or IP address of your Front End. For the “username” and “password” use “sluser” and “slpass”, respectively. Everything should be setup now. So try deploying a virtual machine. You can look in the Marketplace to find an interesting machine to deploy. We’ll use a ttylinux image here. This is a micro distribution that boots very quickly and is ideal for tests. # Deploy a ttylinux virtual machine. When the machine reaches the ‘running’ status, the virtual machine is running in the hypervisor on the Node. It will probably take some additional time for the operating system to boot. # Ping the virtual machine to see if it is accessible. PING vm-42.lal.stratuslab.eu (134.158.75.42) 56(84) bytes of data. # Now login to the machine as root. (RSA) to the list of known hosts. Going through the full lifecycle of a machine shows that all of the services are working. You’ve successfully installed a minimal StratusLab cloud. You can checkout the documentation to see what other configuration parameters are available or try the user tutorials to discover more of the StratusLab services. You can get help on the installation or use of StratusLab through the support mailing list. You can also report bugs and provide feedback on the same list. © Copyright 2014, StratusLab Collaboration.